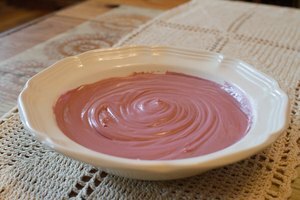 Equal parts of red and green water-based food coloring mixed with pure white frosting produces a base brown color. To create shades of brown food coloring – almost a necessity for detail work – food color gels work best. Gels are more effective than primary water-based colors because you need half as much gel-based color as you do water-based. You can also fine tune and tint the frosting color to a greater degree with less guesswork when using gels. 1. Add 12 drops each of red and green water-based food coloring – for every 2 cups of frosting – to a disposable cup. Mix the colors with a toothpick. 2. Stir in red, yellow or green food color one drop at a time to adjust the color. A drop or two of red food color imparts a mahogany hue to the color; the same amount of yellow invests an oak-like quality. One drop each of both red and green color darkens the brown food coloring. 3. Add two cups of pure white frosting to a mixing bowl and make a well in the center with the spatula. Fold the color into the frosting until it's incorporated. The standard folding technique used in baking and pastry applications works well here. 4. Cover the bowl and let it sit in the refrigerator for 1 hour. Let the frosting reach room temperature, and give it a final stir before you apply it. Mix the frosting 1 hour before applying it, to allow the colors to fully set. Winter brown: 26 drops of brown + 8 drops of crimson. 2. Add two cups of pure white frosting to a mixing bowl and make a well in the center with the spatula. Fold the color into the frosting until incorporated. Use the standard folding technique. 3. Cover the mixing bowl and let the frosting sit in the refrigerator for 1 to 2 hours. Let the frosting warm to room temperature, and stir it before using. Colors are subjective; one cook's mahogany is another cook's burnt sienna. 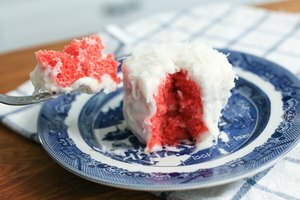 Don't be afraid to experiment with a few additional drops of water-based red, green or yellow until you get the color you're looking for – but do so before you mix it with the frosting. There's no guesswork when you are mixing gel-based specialty colors – mixing one drop each of brown and yellow with two cups of frosting, for example, produces a neutral brown – but you can still adjust the colors to fit your needs.